Every now and then, in between 'pursuits', I thought it might be a good idea to show you what is inside the contents of my make-up bag. I always go through transitions of brands. 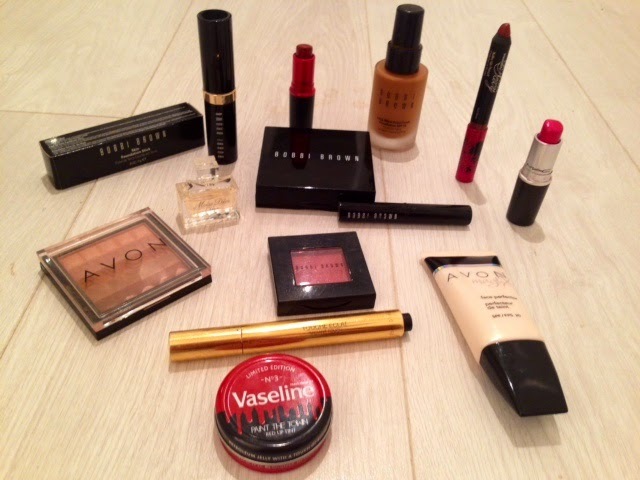 One minute it's all MAC, then I try all Bobbi Brown, at the moment it's a mixture of both including some Avon......and guess what, I'm in the middle of another transition! NARS cosmetics is calling my name, so expect another 'What's in my Make-Up Bag' very soon. I have worn Bobbi Brown Foundation off and on for a number of years now, but I have always worn the liquid form (coming up). 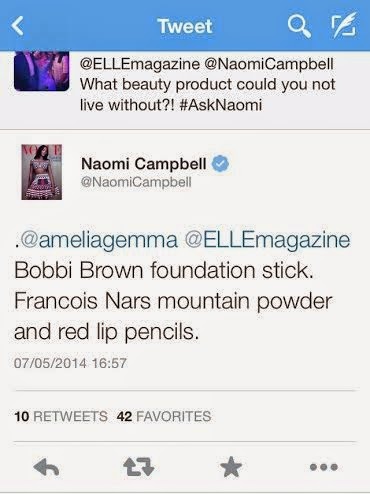 ...Hold on, Ms Campbell says this is a product that she cannot live without?...I must try it! Fast forward to Stansted Airport World Duty Free Shop, when I ask for the Foundation stick in 6.5-Warm Almond, the colour I have worn for the last how many years. The Bobbi Brown consultant happily tells me that I am lucky as its the last one she has in stock and pops it into a bag for me. I skip off smiling inside thinking that I have now got a beauty insider's secret to flawless looking skin. Anyway, long story short, she sold me the wrong colour! A whole shade up.....however....I have tried it and it is still a good match for my skin tone. It is quite a large size and I would imagine that it would last a considerable amount of time due to the fact that you really do not need to use a lot to get a good coverage. It is less messy than the liquid version- just a few strokes all over your face and then I use my fingers to blend it in. No brushes, although I guess you could use one. No messy pump to deal with. The only thing is that although it is a cream on a stick, it does drag the skin slightly as you move it over your face. It is quite solid. Also, it is not very mattifying. I have a very oily T-Zone, and this product alone is not enough to give a matt coverage. A powder is still needed. All in all, I am glad I brought it, easy to apply and blends in brilliantly and looks less cakey than a liquid foundation. Verdict: Thumbs up. I was introduced to this lipstick when I went into the MAC at Westfield Stratford a couple years back. The stunning MAC consultant after hearing that I wanted a red lippy to suit my skin tone immediately went for this one. I not only brought it but left the shop wearing it- a sure sign that I was a happy bunny! It is a gorgeous deep matt red and is really quite flattering. It is easy to apply, but make sure lips are in good condition i.e. no flakiness as it does draw attention to problem areas. Whenever I wear this lipstick I get compliments of people telling me how much it suits me and asking where its from. It has great staying power too, as in it stays on the lips very well but you do get transference onto cups/glasses etc. 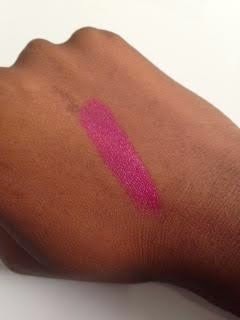 See my post The Pursuit of Accessories for me wearing this lipstick. Verdict: Again, thumbs up. This is the product I had been using before I transferred to the Foundation Stick. Again, it was a great match for my skin tone. Not too orangey or yellow but also not ashy. It had good coverage but it is very easy to apply too much and that's when it can look cakey and oily. I used to use a brush and sometimes fingers to apply this, but its so messy. I used to get smears on my light switches and wardrobe doors from not wiping my hands properly after applying and it has ruined so many bath towels as I always used to just grab a towel to wipe any spillages or excess off my hands. It's also supposed to be oil-free but I found it extremely oily-especially around my eye lids and nose area. I stuck with it for such a long time because the match was so good and also I don't really wear a lot of foundation so it was good for what I needed. Verdict: Trumped by the Foundation Stick. This lip pencil is being discontinued by Avon!! 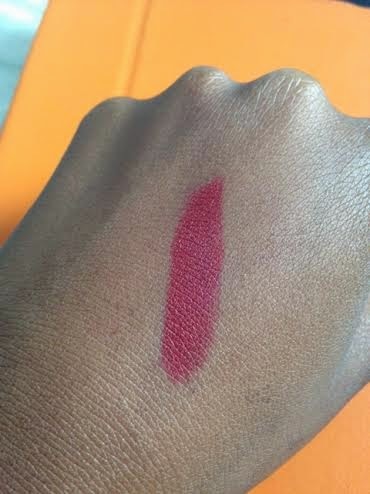 It is almost the exact match for MAC's Viva Glam but is a slightly deeper red and again is a matt look. It is more like a lip crayon than a pencil but does the job of a lip pencil as well if you outline your lips before filling in. I absolutely love this and have ordered 3 from the latest campaign as it won't be featured any more which is a real shame. This lip crayon has brilliant staying power, only really need a little touch up after eating etc. I love matt colours but you really do need to keep your lips in top condition. I use Elizabeth Arden 8 hour cream at night on my lips and use a finger in a flannel to exfoliate and get rid of any loose skin. Another lipstick introduced to me by the girls in MAC Westfield Stratford. A bright punchy almost fuchsia pink/purple. It's a great fun colour and really does stand out. It's not for everyday wear...well, for me anyway....but it really does bring together a look/outfit. It's a creamy consistency rather than matt and feels lovely on the lips although you do need to reapply this more often. See my post The Pursuit of Accessories for me wearing this lipstick. This is a cream to powder formula that is designed to smooth pores and lines and give a oil-free HD finish. As I have already stated, I feel I suffer from that dreaded 'forehead' shine so this really appealed to me when I read about it. Your supposed to wear it under foundation to perfect the skin or you could wear it alone. It is a solid white colour when it comes out the tube which is quite frightening as you wonder how it will blend in but it does dissolve and disappear and becomes colourless. It has a strange kind of 'chalky' almost consistency when blended and is instantly mattifying. You really have to work it in though to get rid of any signs of the white residue. I'm not sure about this one. I tried it a couple of times but felt like my pores were clogged and I got a tiny little rash of spots down the side of my face. I think it might be good to use after your make up is applied to tackle shine as and when it happens but I did not like the feel of this one. It has a gorgeous smell though as it contains rose extract. Verdict: Still in two minds- might need to try a few more times. This little Vaseline tin is so cute. I love the red colour and it has a great sillouhette of a city skyline on the front. Its much more expensive than the other ones from the range coming in at £3.49 approx. but that could be because its a tint aswell. I don't like it. It smells too fruity and doesn't tint the lips that great. You cannot build the colour up as your lips just become to greasy. 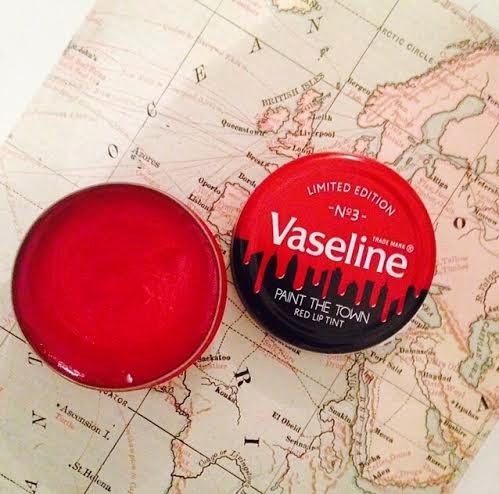 I'm not a great fan of Vaseline on the lips per se anyway as I feel that it doesn't really moisturise but just creates a barrier that can in my case irritate your lips. Also it wears off so quickly that you just become addicted to applying more. How many people have you seen continuously applying their tin of Vaseline religiously every 30 seconds. Far better to put on a bit of long lasting lip gloss. Apart from looking good in my makeup bag this is a no-no for me. Verdict: Thumbs down. I discovered Touch Éclat back in 2000 when I was flying. It used to fly off our duty free cart and I wondered what all the buzz was about. Back then it only came in 4 shades and the number 4 you could only get in certain countries-not including the UK. I used to buy it in Sephora in New York and Miami and then it started to appear in Selfridges in London a few years later. Now, at last, they have an extensive colour range to suit all skin tones coming in at a whopping 12 shades! How far we have come. I use number 6 as strangely number 4 has disappeared when they overhauled their colour grading system. It is by far the best under eye concealer I have ever used. But it is much more than that- you can use it to bring luminosity and radiance to the brow bone, contour your nose area and even to create fuller looking lips. 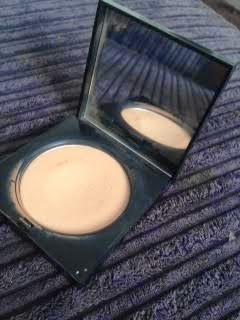 This will always be a firm favourite in my make up bag. Verdict: Big thumbs up. Avon have really impressed me with this shimmer block. It really does rival the big luxury brands including the Bobbi Brown Shimmer Brick which I think it has been inspired from. Unlike the BB Shimmer Brick it only comes in only one colour palette at the moment which is a lovely golden brown with bronze colours. It has a very subtle shimmer to it so you don't get lots of glitter all over your face and I find the golden colours work well on my skin tone. They are probably not dark enough to do effective contouring but it does give a lovely highlighted look which I love. I always carry miniatures in my make-up bag. It's nice for when you just need a little touch up instead of having to carry the full size around with you. It's quite fruity and floral which is the notes I am normally attracted to. My all time favourite Christian Dior Perfume though is J'Adore Dior. I love, love, love this scent and I just love that advert with Charlize Theron running backstage to make it onto the runway in time even more! So chic, glamourous and sophisticated-J'adore!! This is my shine-free god send! A sheer powder that I just use a brush to sweep all over my face to set my make up and keep it matt. It is not chalky at all and this is the one that works for me. In the past I have used similar products from MAC including MAC Blot Powder, but this one does not look cakey after application-that dreaded after effect of applying too much product. This tiny stick I use on top of concealer after I have applied it around my eye area. Just a tiny amount and then blend it in so I don't have a tell-tell concealer circle. It is brilliant and really just a smaller version of the Foundation Stick. This blush if you look at is has lots of tiny reflective particles in it and it does have a beautiful shimmer effect when applied. I love deep maroon/red colours but with an added bronzer effect and this delivers. Too much and I do look a bit 'Aunt Sally' in Worzel Gummidge! so I have to be careful with my blusher application as I never think I have enough on! For years I used a similar colour blusher from Iman but then as always when you become too accustomed to a certain colour they discontinue it. This is the closest I have got and at the moment I like it. So that's the end of 'What's in My Make-Up Bag' for now. I hope you have enjoyed this review. When I have made the transition to NARS or anything else that takes my fancy along the way, I'll update you all with another edition!